Office hours: Monday 2:30-5:00 p.m, Wednesday 3-4p.m.& Friday 2:30-4:00 p.m.
HW1: QSS, Page 283, 2, 5. Design and implement a numerical experiment to verify that the secant method converges at order p= the golden ratio (1+sqrt(5))/2. Due Wednesday, October 9. HW4: QSS, Page 376, 7, 12. Write a computer program to approximate |x| on [-1,1] based on (i) approximation by the degree n Lagrange interpolation at (n+1) equally spaced points, (ii) approximation by the degree n Lagrange interpolation at Chebyshev points, (iii) the degree n Bernstein approximant, (iv) Newman's rational approximant. Generate appropriate error plots and explain if the empirical results are consistent with known theoretical results. 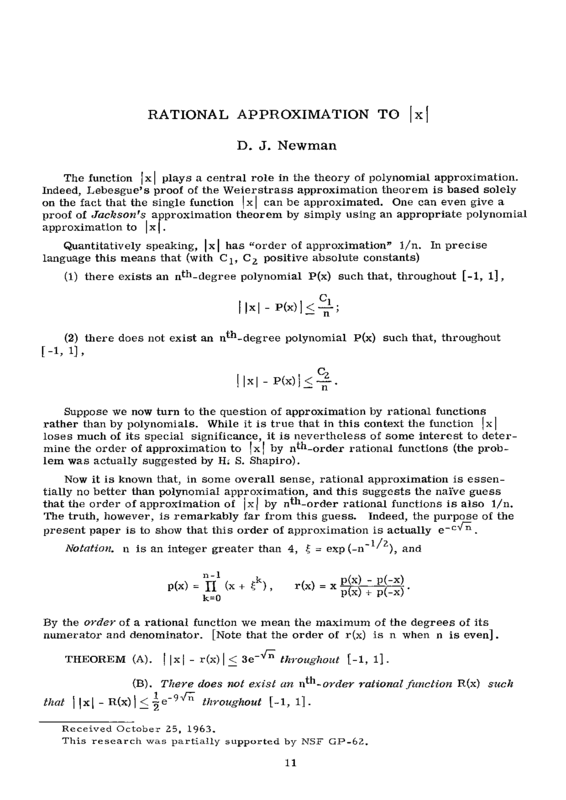 Here's an article about D. J. Newman and the first page of his famous 4-page paper on rational interpolation written at Philadelphia. A demo for Trapezoid rule on periodic function: TrapezoidPeriodic.zip, and an extensive article on the analysis of Trapezoid rule by Trefethen and Weideman. Midterm and final exams makeups will not be allowed, except for the REAL emergencies. Those should be communicated to (and agreed to by) me ahead od time whenever possible. If not possible it will have to be supported by a solid evidence.